Despite the fact that we’re already halfway through March, these cold and rainy weekends have definitely not inspired me to create anything that’s light or refreshing. Instead, I’m making the most of this wintery weather by (what else?) embracing wintery food! This comfortingly warm pie is a worthy opponent for grey and blustery weather, and is best shared with your family or flatmates on a Sunday afternoon. Begin by heating the vegetable oil in a large frying plan. Add the chicken and cook on medium heat until the outside is a lovely golden brown (about 5 minutes). Transfer the chicken to a plate and set aside. Add the bacon to the frying pan and cook on medium heat for about 5 minutes or until brown. Then add the onion, mushrooms and thyme and cook for a further 5 minutes or until the onions start to go brown. Add the flour to the frying pan and stir until mixed in, then remove the pan from the heat and add the chicken stock (do this bit by bit) followed by the milk. Return the pan to the heat, add the chicken back in, and simmer on low heat for a further 30 minutes. Pour the contents of the frying pan into a casserole or pie dish and leave to cool for 20 minutes or so. In the meantime, preheat the oven to 220°C/425°F/fan 200°C. On a floured surface, roll your pastry out until it is slightly larger than your dish, at which point it should be roughly 4mm thick or slightly thicker than a pound coin. After the 20 minutes of cooling time has passed, brush the edge of the pie dish with the beaten egg. Carefully transfer the pastry onto the dish, trim the edge so that it’s flush, press tight against the dish and cut a few slits in the top. Finally, brush the top of the pie with the beaten egg and pop into the oven for 30 minutes or until it’s a lovely brown colour. It will be hot when it comes out of the oven, so is worth resting for a few minutes if you’re patient enough. After that, tuck in and take comfort in the fact that your belly will soon be full of warm food! 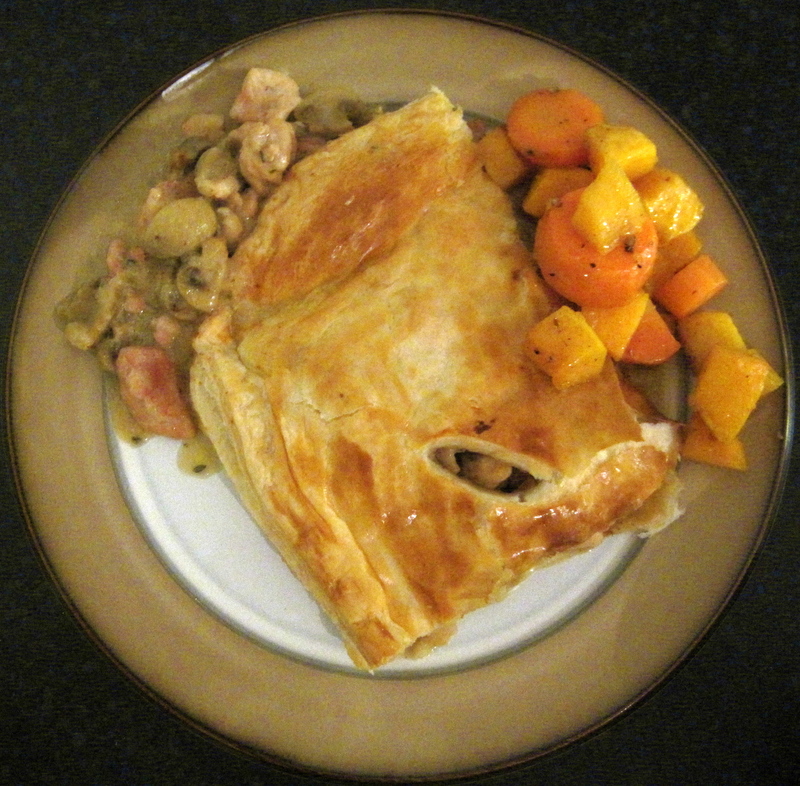 Many thanks to BBC Good Food for their original Chicken & mushroom puff pie recipe which has been adjusted only slightly.